1. The air force alone is conducting this stage of the Israeli offensive with fighter jets, helicopters and drones. The boosted ground forces massed outside the Gaza border fence are being held back for a later stage depending on how the operation unfolds. 2. Three Hamas internal security and intelligence command centers were struck in Gaza City as week as the Hamas leader Ismail Haniyeh’s bureau. They had all be evacuated in good time after the iDF sent warning rockets as part of its ”knock on roof” policy for minimizing civilian casualties. 3. No Hamas casualties are so far reported, indicating the IDF is still keeping its counter-terror offensive law key. 4. Haniyeh’s bureau was struck as a message from the IDF that if the conflict is drawn out, Haniyeh and other high-ranking Hamas officials or commanders may be targeted in person. 5. Within short hours, Hamas and Islamic Jihad retaliated with a massive rocket barrage against Sderot, which knocked over a home. Their payback could extend to other parts of Israel during the night. 6. 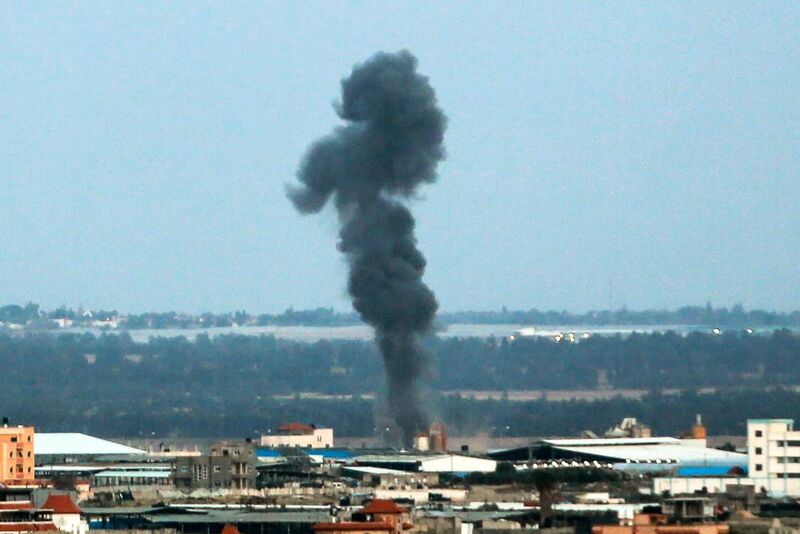 Following this attack, Hamas claimed a truce had been agreed, which Israel has not confirmed. Bomb them strong , I want to see terrorists killed. The antisemitic squatters can’t do anything besides bomb with weapons provided thanks to the $10m/day welfare checks. They’re like prison guards who get their brains beaten in by prisoners. Yes, much, much weaker than a spider’s web or anything known to Man! Are you talking about the fascist dictator’s fear-based response to bottle rocket fire? Safely drop bombs on bombed-out buildings from 10,000 meters because an attack would result in many dead squatters. The time to attack hamas is not when the rats hide in underground bunkers but in between when they are not firing rockets into Israel. And no more advance notice by Israel. Hamas always tries or claims to have a ceasefire what Israel retaliates after hamas lunches rockets. I do not know why Israel always falls for this and stops the retaliatory strikes. Throughout the last year with the escalation of violence on the part of hamas, Israel did nothing. hamas views this as weakness and continue to mount their Terror. Now it will take a much greater Israeli response to put an end to this Terror. And put it into it, they must. With a strong show of force, so hamas is no longer dictating terms. Another ceasefire ?? For how long one day or less?? Up to the next round…. aka the never ending story. It all depends WHERE it is signed off. Let us say the cease fire is signed off in the South of Sinai, on their way to the new settlements down by the waterfront along the Gulf of Suez. IF there is cease fire I am not voting for Netanyahu. Time for Israel to reclaim Gaza and send the Palestinians back to Jordan. Perhaps the West Bank also. Before June 1967, the residents of Gaza were known as “Egyptians”, not Palestinians and those of the so-called “West Bank” were known as “Jordanians”. Those who today call themselves “Palestinians” have their family clans originally from Lebanon, Syria, Jordan, Iraq, Egypt, Libya, Saudi Arabia and the Gulf region, not from Israel. Bomb the tunnels, kill their leaders, knock out their power supply. The apartheid squatters should murder 200 unarmed demonstrators. That will show the world! It’s time for someone to nuke Tel Aviv. AND KILL YOUR SHARMOUTA MOTHER? Keep wishing Brady! We’ll see ISIS caliphate revived & global sharia law enforced by Sudan before that happens. Lol. Keep dreaming Aladdin, make your last wish. Don’t be silly–you know perfectly well that the antisemitic squatters love the Saud family’s head-chopping, liver eating mercenaries. That’s why they provided them free handjobs in the Stolen Golan while the Syrian ARAB Army bashed their teeth out. Ok Frank, you die of cancer, but the nuke goes into the water at the very bottom and 1 mile west of Deir al Balah. The tsunami will surely wash out all Hamas sins. See, you can’t have it all, only yo part baby! Go right ahead Frank, but before you do, kindly walk over to your living room window, look outside, and tell us just one thing………………………………is it a nice day in Tehran today? Warn the leaders of Hamas that they will be personally blamed and targeted, and then do it if one more rocket or terrorist event occurs. WHY IS ISRAEL NOT SERIOUS ABOUT TAKING OUT HAMAS AND ISLAMIC JIHAD? How come Hamas terrorists do not us the “knock-on-roof” technique against Israeli targets? That is because they mean business AND SO SHOULD ISRAEL!!! What is holding Israel back and why are they taking so many chances with the lives of their citizens? Isreal is trying to keep the casualties down for civilians!, unlike the coward’s of hamas.no more cease fires!! !.and no more warnings for Hamas!!!. F__ck peace… give war a chance! Suddenly the bosses are hurt in their pockets. Understand that, to do exactly what you specify, the Israelis would have to bomb downtown Beirut, Tehran, Ankara and Istanbul………………where Hamas’ bank accounts are located. Laughable! The same squatters who freak out about kites are going to wage wars against Istanbul and Tehran!! It must be fun pretending that others have the same capability as the Semitic Palestinians living in a concentration camp. The comedy’s why I love this website. The squatter-bombers would be turned to cinder by air defenses before blowing their load. Israel knocks out Hamas HQ and other empty buildings after warning them to evacuate. Who ever heard of giving the enemy time to escape before bombing their empty buildings? Israeli leadership must have their reasons, but I don’t get it. Hamas tries to kill Israeli civilians, Israel tries to avoid killing Hamas enemy. Makes no sense. he is not a defender of Israel, but a true politician now. the less waves , the better I look. now needs $2000 to finish the character. B— 52 brings understanding & dismay ! Jews should not fall for the fake pressure of the antisemites, and the weak political correct traitors from within. Strong Jews get more respect in the end of the day anyway. And now With Trump in power; when are you ever going to finish off this problem, instead of being the knock knock laughing stock of the world? If not now, than when? Today at the bomb shelter to which I scurried I was diagnosed with shock. I also peed myself. The Big Bad Palestinians keep shooting BOTTLE ROCKETS at me and I’m so so so scared. Meanwhile, Iran and Syria and Hezbollah all have big and mighty armies. What are we ever to do? How can we continue to murder with impunity? Time for me to do what mommy and daddy always said–let a piggie take you from the backside. It feels good, and makes you forget the pain. I have a number of empty buildings which require demolition at considerable cost. As experts in empty building demolitions, would it be possible to contract the Israeli air force to undertake these demolitions? If you bomb empty buildings, the Dotard will give you a $10m check every day AND supply the weapons. Hamas is being spared by Israel because it suits Israel to have a Palestinian party that is in opposition to Fatah. Politics is a very dirty game and the Israeli public always pays a price. If Israel destroys Hamas, it means that Israel will then have no choice but to make peace with Fatah and hand over the West Bank. As long as Hamas is around, the excuse can be used that the Palestinians do not have their affairs in order due to rivalries and infighting so that Israel does not have a trustworthy group to negotiate anything peaceful with. The buildings bombed were empty because Israel warned them of the impending attacks; so Hamas leaders went to the nearest schools and hospitals to be safe. You can bet if the rockets continue by Hamas they will be attacked by ground troops and they will be searching for Hamas leaders. When was the last time Israel went into Gaza and chased out the rats; 2014? The “little Jew boys”, as you refer to, had very few aircraft and no drones at all in 1948………………..but they won against all odds. What’s really pathetic here is your post. Sounds like you’re still upset that the side you supported LOST WWII!